I have been tracking micro finance and social entrepreneurship for quite some time now. Of course after the success of Gramin Bank “Micro Finance” is Macro. But me being a *web* person was impressed with Kiva’s usage of web and social media for doing its part in eradicating poverty. At Kiva you can start your social investment (sounds better than lending right?) starting from $25. Such multiples $25 can help a farmer to buy a cow in Zimbabwe. Even though I have been great fan of Kiva, I never lent any money there. With millions of people below poverty line in India, I was waiting for them to start their program in India. Strangely it has not happened yet. As usual I turned twitter for help. There were two main suggestions from my twitter friends for Kiva like organization in India dhanaX and RangDe. Both do micro financing in India through web. I had heard about dhanaX on one of CNBC programs. Naturally I went there first. Unfortunately the minimum amount you can invest there is Rs.10000 ($200). That is big for most of us to start with. The next choice RangDe had a min limit of Rs.1000 ($20) which worked pretty well for me. It didn’t take long for me to create an account there. You just need an email id for registering. 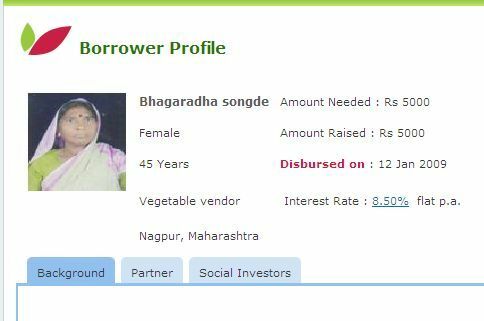 For lending, all I had to do was search for the borrowers depending on my criteria i.e women, education etc. Since I have set a personal limit of Rs.500/lending I choose two borrowers. Then like a regular shopping cart, did checkout, entered credit card details and pressed OK. I was done. RangDe’s website is fairly well written and usable (its GWT based..yay..). They have lender and borrower (mine is here) profile pages with enough data. What they don’t have is widget support. I am sure they are working on it but if they are not then they have to. Widgets that lenders can display on their blogs are very important. Its good to have the widgets of my profile page, whom I am lending too ( so my readers can too), borrower profiles etc. Along with widgets they have to provide the same data in the form Facebook/Orkut Apps. Its safe to assume people who lend online are already on Facebook/Orkut. RangDe has to give them a chance. Another feature I would like to see on RangDe is “Lending Groups”. It will be good if me and my friends/readers can form a virtual group to lend as a group. Its similar to Lending Community on Kiva. Congratulations and all the very best to RangDe team for the wonderful work they have done. Rest of you go to RangDe and start lending the needy. Note about the title: I don’t have anything against donation. Donating is good as long as it goes to children and old. For adults its better to teach fishing or buy a net than donating fish. Donations don’t go a long way and are not sustainable. With millions of people below poverty line in India its not the best way eradicate poverty. Wait.. I am not even thinking about completely eradicating poverty but small *things* can help. I dont see anyone from Karnataka. You have demystified micro finance.. Very neat and useful..
@Rahul: Great. Purpose of the post was to encourage others. Now I am happy. @Sandeep: They are adding borrowers slowly. Neat concept. I’m going to LEND a minimum amount too.. possibly tomorrow morning. thanks for bringing into notice this wonderful concept. Thanks Thejesh…me and my friends are joining. @Ashly : I am happy.